HDMI Extender by CAT6 2x uses one piece of CAT6 cable to extend the HDTV display up to 165 feet for 1080p. Has more flexibility and convenience in cable construction. RS-232 serial signals and IR remote control signals (@ 39 KHz) also pass through the transceiver, so your HD Base T installation can control such RS-232 devices as scanners and touchscreen displays at baud rates up to 115 Kbps. HDMI Extender by CAT6 2x uses one piece of CAT6 cable to extend the HDTV display up to 500 feet for 1080p. Has more flexibility and convenience in cable construction. Supports 7.1-channel surround sound, DTS-HD and Dolby True HD. Requires no software or drivers, making setup simple. It mounts to a wall, rack or pole using the included hardware. Plug -and-play. Connects eight HDMI displayers at the same time to the same video source. Splits HDMI signal to 8 HDMI displays completely, has the ability of buffering and amplifying. 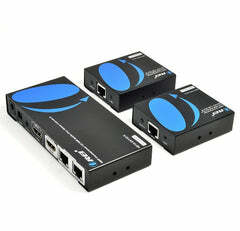 Distribute 1 HDMI source to 2 HDMI displays over network cable simultaneously. 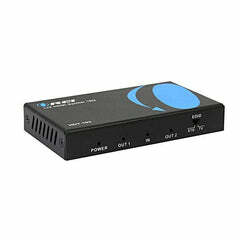 HDMI Transmitter is equipped with 2 Port CAT6 Output. And 1 Additional HDMI Output to connect to a local display or monitor.